Cool Lunch or Refreshing Side – You Decide! 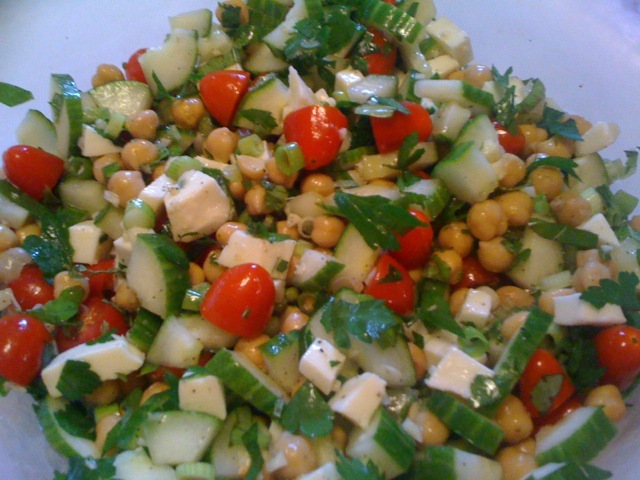 Place the scallions, tomatoes, cucumber, chickpeas, parsley and basil in a large salad bowl. Toss to combine. In a small bowl or measuring cup, whisk together the lemon juice, garlic, 2 tsp salt, and 1 teas pepper. Slowly whisk in the olive oil to incorporate. Pour dressing over the salad, toss gently to coat all veggies. Add the cheese, sprinkle with S & P and toss again gently.